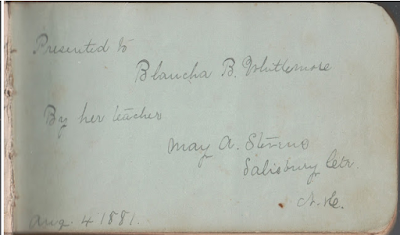 Autograph album that was presented to Blanche B. Whittemore of Salisbury, New Hampshire, by her teacher, May A. Stevens of Salisbury Center, New Hampshire, on August 4, 1881. Blanche wrote her name on the inside cover and on the first end paper. 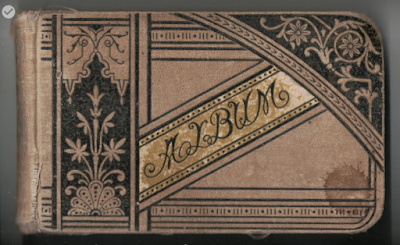 The album measures approximately 5-1/4" by 3-1/4" and contains the sentiments of 65 of Blanche's relatives, friends, schoolmates and teachers, including those at Proctor Academy at Andover, New Hampshire, still in operation today. 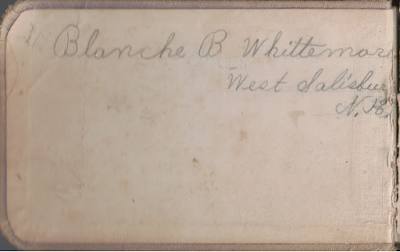 Blanche had a brother, Charles E. Whittemore, who inscribed facing pages in the album, one at West Salisbury, New Hampshire, in 1881, and the other in Salisbury, New Hampshire, in 1887. 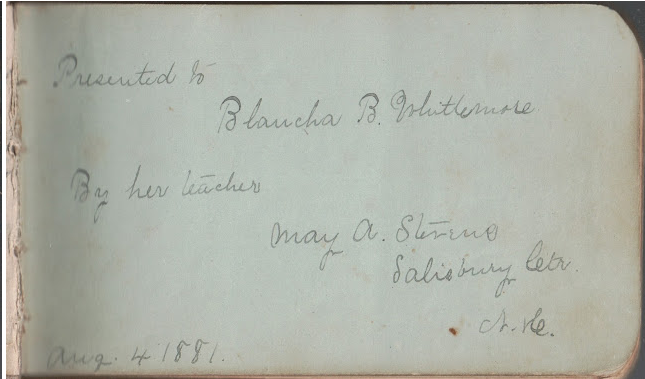 On October 16, 1895 at Manchester, New Hampshire, Blanche married blacksmith Sherman Pliny Fellows, son of Pliny A. Fellows and Mary A. (Stevens) Fellows. At the time Blanche was teaching school. Blanche and Sherman had at least one child, a daughter Hazel Gertrude Fellows, who died in infancy. Lizzie ? of Lowell, Massachusetts, inscribed on August 29 [no year written]. Surname is possibly Huntoon or Hudson or ? 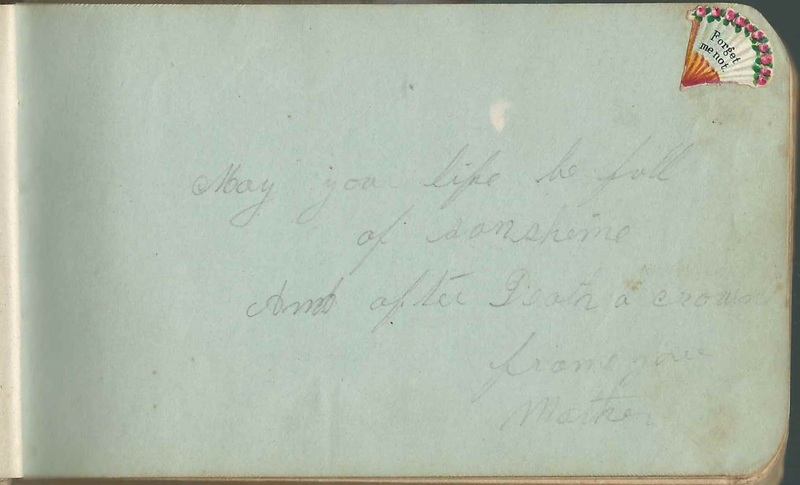 Mary K. Dunlap of West Salisbury, New Hampshire, inscribed on December 6, 1887. She wrote "Kitty" in the corner; presumably that was her nickname. Mary Kenerson, inscribed on March 17 [no year written]; not sure of surname. James M. Morse, Blanche's uncle. Possibly the James M. Morse who was married to Martha Ann (Whittemore) Morse. True E. Powars of Boston, Massachusetts, inscribed on 10-4-88; Blanche's schoolmate at Proctor Academy. The "P.S." in one corner might indicate the Philo Society. Possibly Gertrude E. Powars who would marry Henry P. Tilden. 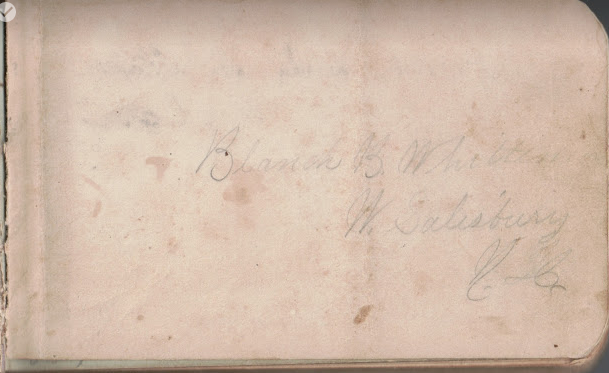 Lizzie F. White of Andover, New Hampshire, inscribed at Proctor Academy on February 5, 1889. 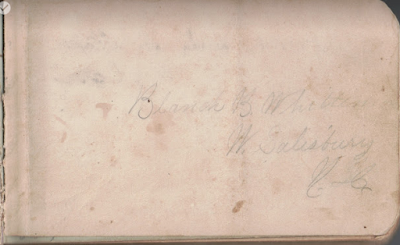 The penciled names Fenton and Elkins has been added to the page. Lizzie married John Fenton on December 26, 1896 and Jasper R. Elkins on October 6, 1906. C. E. Whittemore of Salisbury, New Hampshire, inscribed facing plages on November 21, 1881 a West Salisbury, New Hampshire, and on November 9, 1887 at Salisbury, New Hampshire. Presumably Blanche's brother Charles E. Whittemore.